Since antiquity, people have fashioned support equipment to hold themselves up when they became injured or sick. One such support device is a crutch, which has evolved from the ‘T’ used by Tiny Tim in the famous Christmas Carol. Initially, crutches were introduced as aluminum braces with gripping tips that function as slip resistant and shock absorbers. But nowadays, there are varieties of crutches available in various designs and styles. Crutches are mainly used by people with lower-limb injuries like broken ankle, broken leg, knee injuries, sprained ankles, and other issues on the ankle, foot, knee, and leg. These equipment decrease discomfort, reduce recovery time and support walking. Often when you get a cast on your foot or leg you would need crutches for a period of time. In addition to this, crutches are also used by people with disabilities that make walking difficult. If you are looking out for the best crutches, then this post will share you the same. But additionally, this post will tell you everything about crutches – function, types, best ways to use, and how to pick the best one for yourself. So, read this post till the end to know everything about crutches. A crutch can primarily do two things – reduce weight load on the injured leg and enhance your support base to improve stability and balance. The support also must assist upright movement and transmit sensory cues via hands. With a crutch, people with disabilities or paralysis of leg benefits of an upright posture and let them maneuver in a place where they cannot go with a wheelchair. A crutch is essential for a person who cannot walk or walks with extreme difficulty. Any person with a foot or leg pain or injury, weak muscles or an unstable gait can benefit from using crutches. With an upright body movement, it is possible to move comfortably and this also prevents calcium loss from the bones. Crutches shift the force or weight of upright movement from the legs to the upper body. But it is essential that you possess ample upper body strength or at least arm strength to balance, coordinate and use crutches effectively. There are different types of crutches available in the market. All these crutches take the weight off the lower limbs and work in different ways. You can select an appropriate crutch only when you are aware of the different types of crutches. Also called as axillary crutches, these are usually used by people with short-term mobility problems. One part of the crutch is placed in the armpit against the ribcage, while the other section is held by the user with the hands. Another common type of crutch is platform crutch, which is meant for people with weak hands resulted from conditions like cerebral palsy and arthritis. These crutches are used by holding a handgrip while resting the forearm on a flat surface. It is a less common type of crutch as compared to forearm and underarm crutches. Another type of crutch is a forearm crutch that is also known as Lofstrand crutch. This crutch needs the user to place their arm into a cuff while holding the crutch with a handgrip. Individuals suffering from mobility issues or disabilities can select forearm crutches as compared to other types of crutches. Hands-free crutches are the newest types of crutches that need the use of the hands to offer additional support to the user. The users simply rest their knee on the injured leg on the crutch. This form of crutch is not suitable for all conditions and needs some getting used to. It is a perfect choice for people who want convenience and independence with their mobility problems. So, if you want to know the best types of crutches under various categories, then here find our comprehensive list of best crutches. Forearm crutches offer support to people with weak legs. Some of such crutches have platforms for added safety and stability. 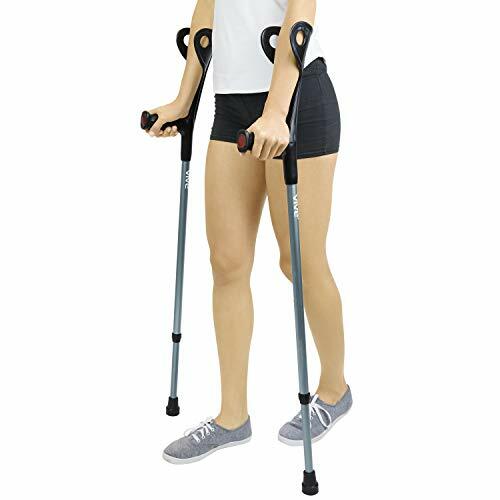 These crutches offer partial weight bearing support and hence are usually used by adults and children. Patients use these crutches by slipping each arm into a cuff and holding on to the grip of crutch. The cuffs are made of plastic or metal, and have an opening that allows the forearm to slip out if the person falls. Product Innovation: Latest Generation, Stronger than Ever!! Finally, a comfortable, fully adjustable crutch designed to make people's lives easier during recovery, while reducing any secondary injury commonly caused by conventional crutches. If you have suffered a recent sports injury, have joint pain or issues with mobility, then consider the Ergobaum Forearm Crutches with Shock Absorbers as the best crutch alternative. 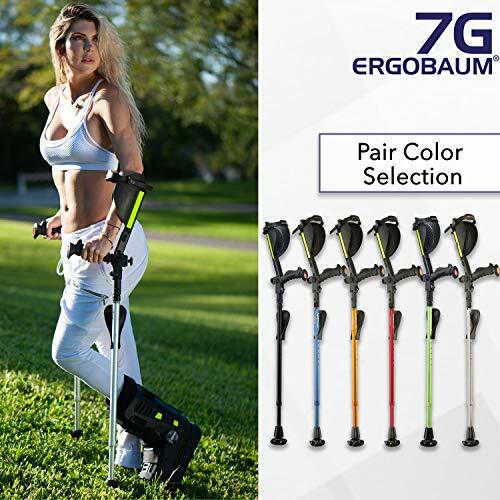 With a spring-loaded shock absorbing technology to reduce impact, this seventh generation Ergobaum foldable crutch is one of the best forearm crutch available for use. The crutch comes with crutch tips for extra balance and incorporates nighttime safety features, like a horn, light, and reflectors. One of the best aspects of this crutch is a built-in keen rest platform, a forearm cup, and strap, as well as an adjustable cushion grip. The crutch is designed by an orthopedic surgeon crafter from medical-grade materials. Furthermore, the crutches are height adjustable. Hence, you can always adjust the height and use it for long-term and short-term use. The crutch has been designed to offer ease the post-injury recovery and would eliminate our entire discomfort and pain. It is an excellent choice for people suffering from occasional traumas or those with a permanent disability. Tall Adult has a 250-lb. weight capacity, Patient height, 5'10"-6'6"; Adult has a 250-lb. weight capacity, Patient height, 5'0"-6'2"; Youth has a 250-lb. weight capacity, Patient height, 4'2"-5'2"
The next forearm crutch in our list is from a reputed company Medline. Because of its high-quality engineering and unmatched durability, this crutch is suggested for individuals with long-term disabilities or conditions. 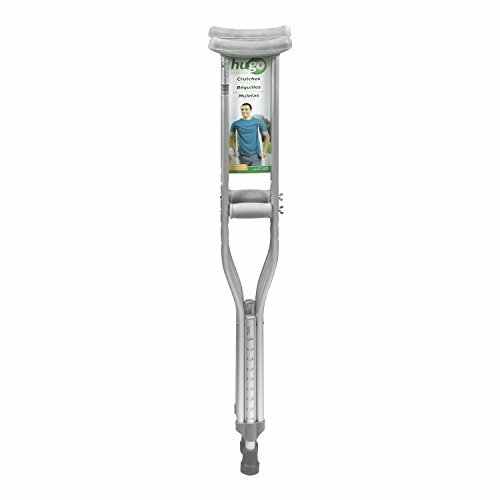 Hence, if you are looking out for a crutch that is sturdy and durable, then this one is a premium choice. The crutch is loaded with numerous rich features including high-strength aluminum construction, contoured and tapered arm cuffs, black cuffs, and strong grip to hide signs of wear and tear. Additionally, it delivers total silence while use and the telescoping components include external lock nuts as well as internal bushings. The crutch weighs around 250 pounds and is available in three different sizes. Swiveling arm cuffs can be customized to fit and serve any user. These crutches are easy to handle and efficient for individuals with postsurgical rehabilitation or slight injury. A perfect solution to reduce discomfort and pain, this forearm crutch by Vive is the next highly-efficient forearm crutch in our list. The crutch reduces fatigue and pain to a great extent and is usually associated with crutch use. With a supportive design and ergonomic grip, the crutches are contoured to perfectly fit your hand. The best feature of this crutch is that it comes with non-marking and non-slip rubber tips. Most importantly, it incorporates a molded arm cuff and grip that contribute to further longevity and stability of the crutches. With a push-button mechanism, adjusting the crutch length by one-inch increment is easy. The weight made of aluminum is lightweight and corrosion resistant and can conveniently support the weight of up to 300 pounds. The crutch comes in a stylish design and is perfect for people of all ages. Underarm crutches are ideal for people with temporary disabilities or injuries. Patients use these crutches by placing the pads underneath the armpits and holding the grip. Such crutches need less upper arm strength as compared to other crutches and need very little training. Also, these crutches cost less than other kinds of support crutches. Underarm crutches need proper fitting to prevent problems. It is essential to make important adjustment like the height of crutch and distance from the underarm to support proper handgrip. ADJUSTABLE, ERGONOMIC HANDLES: The unique ergonomic design of our handles keeps hands and wrists in their natural position, allowing for a comfortable grip while eliminating wrist pain and offering nerve damage relief. Each wrist-support handle fits snugly around the hand and features padding that is designed to reduce the impact on the wrist, lowering the chance of contracting carpal tunnel syndrome. ARTICULATING CRUTCH TIPS: Our Articulating Crutch Tips assist in secure footing, providing stability on uneven surfaces and unstable ground. They are excellent on solid, indoor surfaces such as hardwood floors or carpet, and great on outdoor surfaces with grass, gravel, and dirt, giving the user extra maneuverability. A MOBILE & DURABLE CRUTCH: Lightweight and durable, our Life Crutch is professionally used by the NCAA and can support users up to 300 lbs. We take pride in the design of our light aluminum frame and its heavy-duty construction, which ensures our product's strength and durability, especially throughout the handle portion of the crutch. 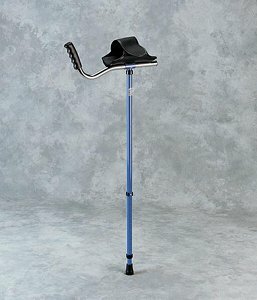 GREAT FOR POSTURE: In addition to added comfort on the wrists and shoulders, our highly adjustable, ergonomic design allows for users to naturally walk more erect, which is normally a challenge for most conventional crutch users, thus making them essential for a proper and speedy recovery. They are highly recommended for patients undergoing physical therapy. ONE SIZE FOR ADULTS & KIDS: With 19 height adjustments for the handle, our Life Crutch fits users with heights varying from 4'6" to 6'7'' (54" - 79"), making it suitable for men, women, and youth, tall or short. The Life Crutch is intended for SHORT TERM use of 4 weeks or less. If you are a long-term daily user, we would recommend our In-Motion Pro Crutch. This elegantly designed, silver-colored life crutch by Millennial Medical is one of the premium choices available for users. The crutch is designed for individuals who wish quick recovery from any minor or major disability. It comes with an innovative design that would reduce underarm pain, sore wrists, and carpel Tunnel. The ergonomic accessory is available further with adjustable height and supports height ranging from 4ft 6 inches to 6ft 7 inches. It is a well-built product that can withstand the weight of up to 300 pounds. Unlike the traditional type, the articulating crutch tip cover between 75-100% of the surface and enhances safety and stability. The existing users find it easy to handle and love its lightweight of 3.7 pounds. The unmatched sturdiness, comfort, design, and easy to adjust functionality makes it one of the finest choices. Even, you would love the foldable design of the crutch. 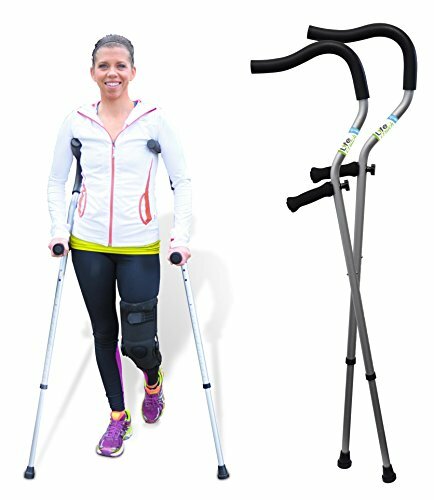 If you weigh more than 300 pounds and is between 5ft 2 inches and 5 ft 10 inches, this lightweight crutch would be a perfect addition to you. The crutch is engineered from sturdy and lightweight aluminum and offers excellent support and enhanced stability to the hefty users. An incredible feature of this unit is that it features a dual push-button mechanism for adjusting the height. In addition to this, it comes with contoured crutch tips for optimal traction and grip. Most importantly, it has thickly cushioned underarm pads that enhance stability and comfort and washable natural sponge handgrips. The crutch has a handle height varying from 3ft 8 inches to 4ft 4 inches. It feels solid but the adjusting mechanism is simple and lightweight. It features dual push-button adjustments and offers exceptional traction with built-in metal ring protects against premature damage. With an added functionality to offer more comfort underarms, this is the next best underarm crutch in our list. The feature that makes this crutch unique is that it is ideal for pediatric. The comforting hand grip makes it perfect for long-term handling. 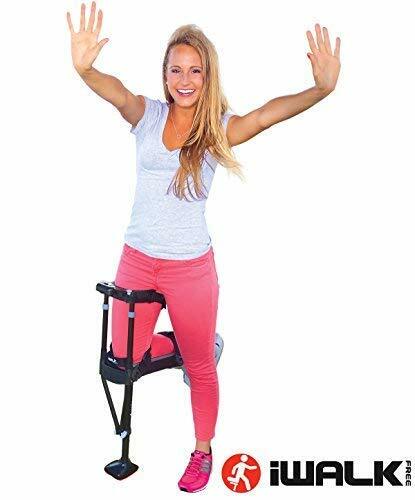 The underarm height of the crutch is 31 inches to 40 inches and for this reason, it is recommended for users with a height of 48 inches and 54 inches. Furthermore, it can manage weight holding capacity of 174lbs, which makes it an ideal solution for people with moderate weight. The crutch further comes with easy wing nut adjustments for enhanced hand grip. Also, you can adjust the crutch height with push – pin adjustments. While the double extruded center tube offers additional strength to weight-bearing areas, the aluminum frame construction provides more durability and stability. The jumbo size, non-skido vinyl contoured tips offer excellent traction. Platform crutches are sized for adults and have a platform that attaches to the top of the crutch. These crutches act as a padded armrest with hand grip. It is useful for those who are not able to straighten arm to grip the hand and hold the crutch. Such crutches allow holding a grip while the forearm rests on a horizontal platform. 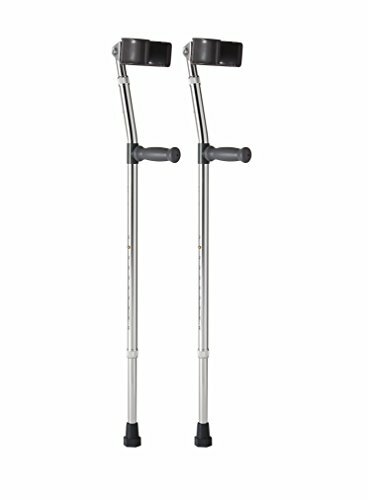 These crutches are commonly used by individuals with a weak hand grip due to any injury or medical condition. Here, check the best platform crutches for every budget. Color : Black, Weight capacity 220 lb. Height can be adjusted from 36" to 44". This Adult Platform Crutch is equipped with a Velcro brand U-shaped sleeve and a contoured grip angle and adjustable using a single bolt. A simple and elegant design, this platform crutch is engineered to with high-quality materials. It is available in black color and has a weight holding capacity of 220lb. One of the best features of this crutch is that its height is adjustable from 36 inches to 44 inches. Hence, people of varying heights can use this crutch comfortably. Another amazing feature of this crutch is that it can be equipped with a Velcro brand u-shaped sleeve and a contoured grip angle that makes it easy to handle. In addition to an adjustable functionality with a single bolt, it can serve people with permanent or temporary disability. This is another highly efficient and robust platform crutch in our list. The crutch is constructed with aluminum tubing, which ensures that it is a durable product. In addition to single side to side handle adjustment, the platform crutch offers vinyl hand grip. Hence, users can expect unmatched comfort while using this product. Moreover, it comes with a hook and loop fastening system as well as easy to change pad, which ensures that using and adjusting this crutch is extremely comfortable to the user. The crutch has an easy change pad mechanism as well as push-button adjustment, which adds to its comfort and usability that it delivers to the user. This platform crutch is suitable for people from child to young ages. The best part is that it is a foldable product and hence you can store it conveniently, without occupying much space, while not in use. Also, the foldable mechanism ensures that the product can be carried along with ease. 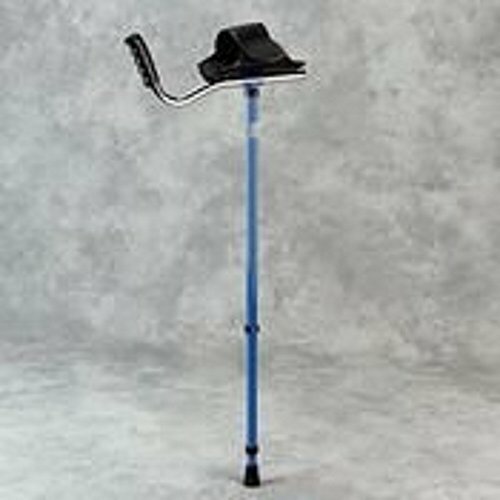 The walk easy adult platform crutch blue is a highly efficient product and made of the best quality materials. The crutch has a weight holding capacity of around 200lbs. One of the finest features of this crutch is that it can be adjusted to a height of 36 inches to 44 inches. Hence, people of varying heights can use this crutch with ease. Another excellent feature of this crutch is that it is made of U-shaped Velcro band that offers convenient carrying of the crutch. Besides an adjustable feature with a single bolt, the crutch can serve people with permanent and temporary disability. Holding crutches with hands can be slightly discomforting and even it keeps your hands engaged. To make sure your hands are free and that you are able to do everyday tasks easily, hands-free crutches are the best solution. Such crutches are primarily used for below knee injuries. It offers you pain-free and hands-free mobility and gives you the ability to live an independent and functional lifestyle. So, check here the best hands-free crutches that would work better for you. CAN YOU USE IWALK2.0? - Let's find out! BEFORE YOU BUY, scroll down to the PRODUCT DESCRIPTION section and read ALL QUALIFICATIONS of our hands free crutch. WILL IT FIT? AGE LIMITS? PLUS SIZE? 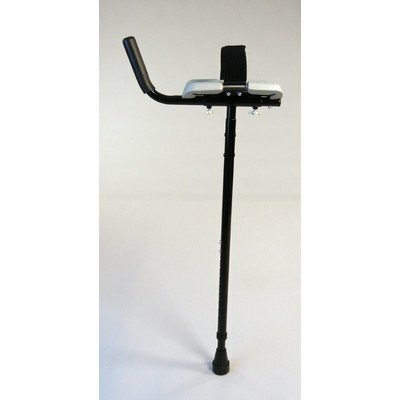 - Read the PRODUCT DESCRIPTION section for all knee crutch requirements BEFORE you buy. BETTER THAN CRUTCHES OR KNEE SCOOTERS - Safe, stable, hands free / pain free mobility. Why use crutches for walking when you can iWALK instead? READ THE ENTIRE LISTING - iWALK2.0 works for most healthy adults and children between 4'10" and 6'6"". See ALL requirements in the PRODUCT DESCRIPTION section below. SO MANY BENEFITS - Scroll down to PRODUCT INFORMATION section to see all the BENEFITS of iWALK2.0 hands free crutches. Now this one is seriously a revolutionary product and perfect if you are tired of using the normal crutches. In addition to offering better functionality, the iWalker2.0 is the best choice for the modern users. It comes in a unique design and offers better balance and support. It is a knee scooter that gives you a hands-free experience. With minimal effort, you can move around this crutch with ease and to distant locations. The accessories available with it are used by people with a height between 5 ft and 6ft 4 inches. It can work well with leg either right or left and features a quick-release strap for convenient removal. 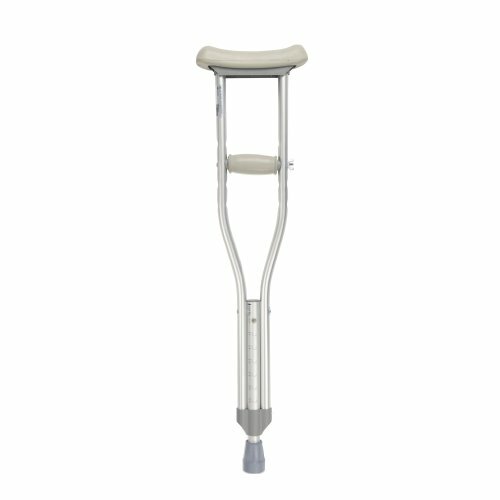 With the padded knee surface, the crutch is highly comfortable. It is an effective and well-built product that is easy to assemble and simple to use. The crutch is extremely comfortable to use, but not fit for obese or elderly people. Product Technology: Special Dynamic Three Module Shock-Absorbing system (Heel-flat-toe) that reduces the impact of the gait on injuries, promoting the fast recovery of soft tissue trauma and stable fractures. It is also an effective tool for lower limp rehabilitation, as well as a post-operative immobilization device. It also benefits patients with diabetic neuropathies because Shoebaum substantially reduces the impact and compression of the microvascular structures of the foot and ankle. Product Unique Features: Embedded air pressure pump with a release valve to inflate areas of the sock that provides a better distributed support and comfort, Convenient Velcro Straps for fast and easy adjustment, Easy front access to supervise wounds without removing immobilization, Removeable "Toe-Bumper System" that protects the injured toe from impact, Anti-vibration and Impact - absorbing EVA sole. Well, this one is definitely not a perfect crutch, but the first patented Air Cam Walker loaded with spring shock absorbers that reduce the impact of the injured leg with the ground while walking. As a result, the fatigue and pain in the injured leg are greatly reduced. It is an excellent product that replaces the traditional, smelly cast, as the patient does not need a regular cast. It is perfect for patients with a fracture who do not need a cast. 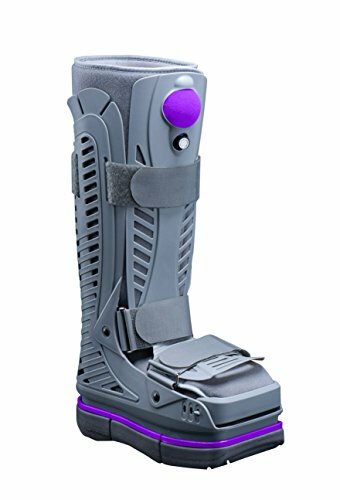 In addition to disposable sock inside the walker boot, it is based on dynamic three module shock-absorbing technology that reduces the impact on injuries. It, therefore, promotes fast recovery among users. Additionally, it is an effective solution for lower limb rehabilitation and an excellent post-operative immobilization device. Also, it is great for patients with diabetic neuropathies as it substantially reduces compression of microvascular structure of ankle and foot. Another premium quality hands-free crutch in our list is from a reputed brand Vive. With stretchable elastic straps that conveniently secure the soft platform, it is an easy solution for most walkers. It comes with a non-slip cover that keeps it firm in place and reduces friction to a great extent. It is a high-quality product, which can withstand regular wear and tear. Furthermore, the crutch is machine washable and can even be washed with colored clothes. It is made of faux sheepskin material that provides more comfort to the knee without irritating the skin and enables air to circulate freely around the lower leg and knee. With an extra layer of soft cushioning, it can evenly distribute the pressure on lower leg and knee and hence relieves pressure and pain. It comes with 60-day unconditional guarantee, which assures that the product is of high-quality and delivers excellent durability. A crutch is best when it is comfortable, stable, and durable. The role of the crutch is to make recovering from an injury easier as well as managing chronic disability simpler and easier. Good crutches enhance balance and stability, absorb impact, and offer users great peace of mind. Some of the best crutches brands on the market are Ergoactives, iWalkFree, Vive, Hugo Mobility, Medline, Mobilegs, Drive Medical, Millennial Medical, Wes Care Supplies, and Carex Health Brands. So, if you have any confusing regarding the crutches brand and type, then you can definitely go for a crutch from any of these brands. Might be, it is possible that you brought a high-quality and one of the best crutches available in the market, but are not able to use it properly. So, this section would tell you about the various ways to use crutches efficiently and in the best way. The first important thing is to properly size crutches so that you can use them comfortably without experiencing problems. The crutches you have brought may need certain adjustment for height. Make sure the crutch is two inches below the armpit when you are standing straight. Further, the handles must be at a hip height so that your elbows slightly bent when holding them. The next thing to use the crutch properly is to ensure they have are comfortable on the armpit grips and especially on the base in contact with the floor. If needed, then get these parts replaced by a medical store, which would be a case if you are using an old crutch. Without enough padding, you would start feeling the pain and discomfort. To get up from the chair you need to place both crutches in the hand on the affected side. For example, if you are injured on left leg, grasp or hold both the crutches by the handle with your left hand. Hold the hand rest of your chair with the other hand, and the crutch handles in your hand. Place your weight on the uninjured leg and push your body up with the arms. Always take short steps while walking with crutches. The steps must be about 18 inches. While supporting yourself with hands, let your body swing forward in a way you were going to move with the injured leg. But rather than placing weight on the injured leg, you must place the weight on crutch handles. Do not allow the crutch top to touch your armpit. Provide support to your body with your hands. Way 1 – Stand close to the step and place the crutches on ground level. Put your weight on the crutches and pick the uninjured foot up first. Then bring the crutches to the step level and put up your injured leg. Repeat the same for each step. Way 2 – Alternatively, if there is a handrail then you can take the support of it. For this, you can hold both crutches in the hand and hold handrail with the other hand. Again, repeat the movement with uninjured leg. This technique is for people who cannot bear weight on the injured leg. You first have to hold the foot of your injured leg up in front and move down each step on the good leg. Make sure you support yourself with the crutches held in front of you while you move on the next lower step. Alternatively, you can use handrail on one side and hold crutches on the other side with your hand. It would be wise if you take someone’s assistance during initial days, particularly when you look good upper body strength. Additionally, never let your armpit rest on crutches, even when you are resting. When moving up and down stairs, take one step at a time to avoid experiencing any hassle. While standing, place the crutches 8-10 inches in front of you. There are varieties of accessories available for crutches to enhance the convenience, usability, and comfort of the user. No matter for how long you would be using the crutch, or whether you are suffering from temporary or permanent issues, investing in accessories for crutches can enhance its overall use. The crutch bags are elegantly designed bags that can be attached to one side of some sorts of crutches. These bags offer a convenient space to store your wallet, keys, medication, snacks, and other important stuff. Another excellent accessory that can be used with your crutch is crutch tips. These tips can offer an extra support and stability to the users. At the same time, it reduces the impact on the hands and arms. Also, crutch tips are great to prevent damage and scratched to your floors. If you want to reduce underarm pain and alleviate discomfort caused by an axillary crutch, then always select a crutch with adequate padding. These crutch pads are perfect for bruising, chafing, or rashes, and can always upgrade to add more comfort to the users. Another type of crutch accessory, which can provide comfort and further aids in healing is crutch cover. This crutch cover fits all standard sizes and is one of the finest crutch accessories available. It is extremely vital to pick an appropriate crutch for yourself. The crutch must provide you enough support and at the same time must be comfortable to use. To ensure you pick the best crutch, here we present the buying checklist that you must consider. You must have a complete and clear understanding of different types of crutches available. You can check the products mentioned in our list in order to understand how different types of crutches work. On the basis of this, you can shortlist crutches that have all the features that you are looking for in your companion. Sure you would not want to tumble while using your crutch and this can happen if your crutch is not strong enough to support your weight. Also, if your crutches are not as per your body weight, then you would always fear of falling down. Hence, before you buy a crutch do check its weight limits and the body construction. The crutch must easily withstand your weight and at the same time must be durable and strong. This will ensure that your weight is well-supported and you feel safe and secured when using these crutches. Buying strong crutches does not mean you pick the heaviest one around. Even lightweight crutches with robust construction are strong enough to hold your weight. Therefore, look for a set that is relatively lightweight and makes it easier for you to get around when you are moving with the crutches. Yes, using crutches can be a discomfort initially, but if over time the discomfort continues then probably you have invested in a wrong pair. To make sure this does not happen with you pick crutches that are mentioned to offer maximum comfort. Also, you would want to make sure that they are of an appropriate height and can be adjusted so that you can keep them at a height comfortable to you. For this, you must consider trying different pairs of crutches so that you can select one that you feel is the most comfortable for you. Q. What is the acceptable size of crutches for kids? A. Teens or high school children can use adult size crutches. But if your child is smaller, then we would suggest using pediatric sized crutches, as they are the most appropriate ones. Q. I am too tall. Can I find a pair of crutch suitable for me? A. Whether you are too tall or too short you can definitely find crutches as per your height. Also, there are crutches available with height adjusting mechanism that allows you to adjust the crutch height as per your requirement. Q. For who are forearm crutches the most suitable? A. Forearm crutches are usually not suitable for people in poor health, have reduced the strength or challenged by long-term ambulatory activities like poor balance, navigating uneven surfaces, and more. People who are significantly overweight are not perfect candidates and can be better served with other mobility equipment. Q. What injuries do we need to use crutches? A. You need crutches if you experience injuries like a broken toe, knee dislocation, broken ankle, ankle sprain, hip replacement, knee injury, fractures, or muscle strain. Buying crutches is not a thing that you would take lightly as might be you could end up using crutches for weeks or even longer. So, you must check the best crutches mentioned in our list and at the same time consider all the factors when shopping for crutches to ensure that you find the most appropriate and comfortable set possible for using while you are recovering from a surgery or an injury.